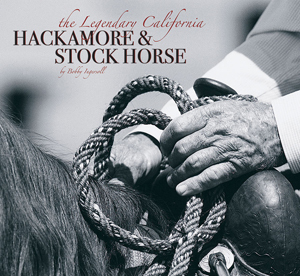 Famous horse trainer Bobby Ingersoll has produced a fascinating book about the history of the California stock horse and the hackamore style of of horse training. The centuries old Spanish tradition is rapidly becoming a lost art. Ingersoll's depth of experience, along with many detailed illustrations by horseman Jim Paul and photographs by David Stoecklein, result in a book that will delight and educate readers. The book is complete with practical horse training tips, intricate drawing and diagrams, and many photographs of signicant riders and their hackamore horses. "Following the Spanish tradition, Bobby's philosophy deals with the eart and mind of the horse. He believes that only through feel, can one truly communicate to a horse, and that's what makes someone a good horseman or what many call a "Horse Whisperer". National Reined Cowhorse Association"